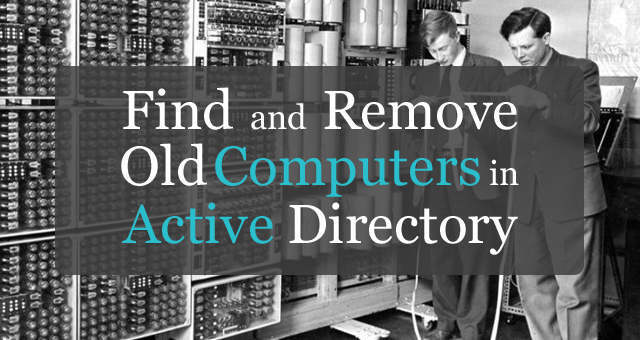 If Active Directory is not routinely cleaned up it can get cluttered with old computer accounts. This can lead to big problems such as inaccurate reporting, group policy slowness, software distribution and patching issues, syncing and so on. In medium to large business, you may be surprised at how many unused computers are left in Active Directory. That is why it’s important to clean up Active Directory from time to time. 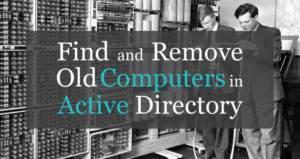 In this tutorial, I will show you 3 different methods for finding and removing old computer accounts. Last logon time: Active Directory computers have an attribute called lastLogonTimestamp, this stores the last time the computer was logged into. Computer password age: Just like user accounts, computers have a password. These get changed automatically every 30 days. The tools used in this tutorial will query either the last logon time or the computer password age to determine if a computer is inactive. Warning: Some of these methods can be very dangerous. I would not immediately delete computer accounts reported by these tools. My advice is to use these tools to find stale computers, disable them for x amount of days then delete them. You may have mobile users, VPN users, users that work from home and those computers will sometimes show up on these tools. It’s safer to disable accounts, if they are still active then you can simply re-enable it. 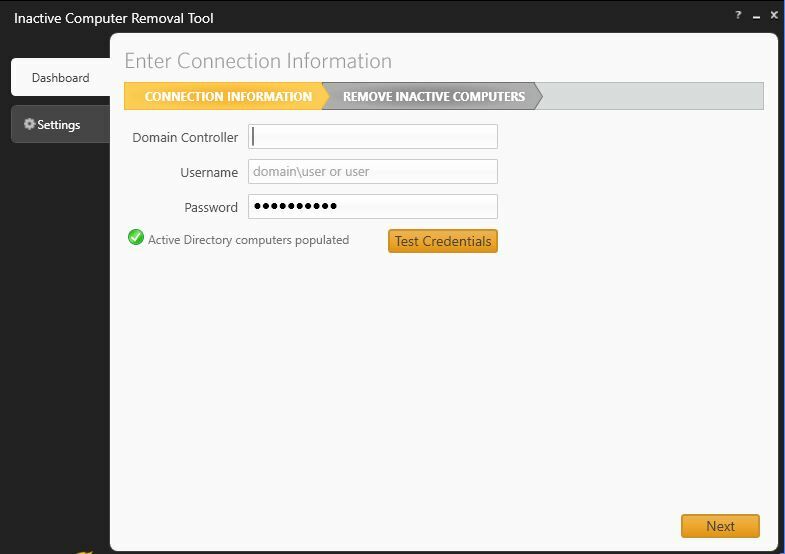 This is a free tool from SolarWinds that you can download here, it also includes a tool for cleaning up unused user accounts. 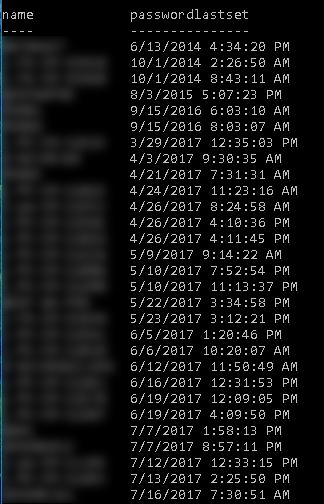 This tool uses the last logon time stamp to find old computers, by default it searches for last logon time older than 30 days. Let’s walk through how to use this tool. Open the tool and configure the connection information. Enter in the IP or hostname of your domain controller, username and password info. If you have multiple domain controllers it will query them all. Click the test credentials button to verify the connection. By default, the tool will search for accounts that have not been logged into for 30 days. I will change this to 90 days. Now go back to the dashboard and click next. 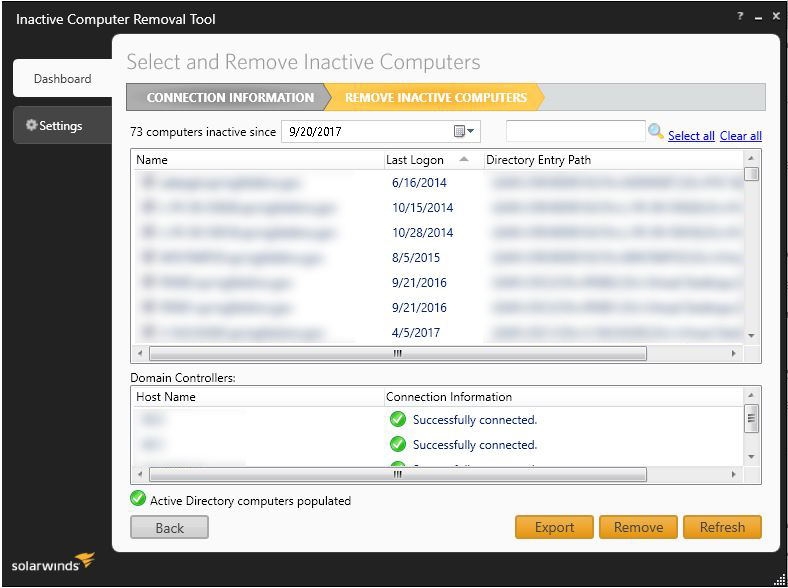 The removal tool will now query Active Directory computers and analyze the last logon time. You can see in my results below it has found 73 computers that have not been logged into for at least 90 days. From here I can select specific computers or all of them and click remove. I can also export the results to to csv. That’s it for methods 1. 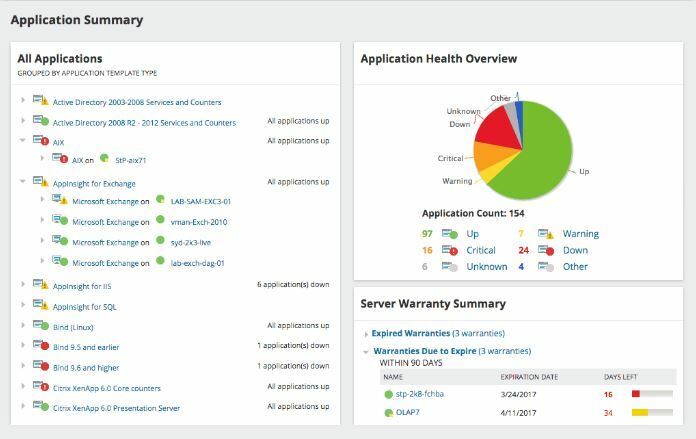 The SolarWinds tool is a very simple and easy method for finding old computer accounts based on the last logon timestamp. Oldcmp is a command line tool that was built specifically for cleaning up old computer accounts. Instead of checking for last logon time this tool checks the computers password age. By default it checks for 90 days but this can be changed. 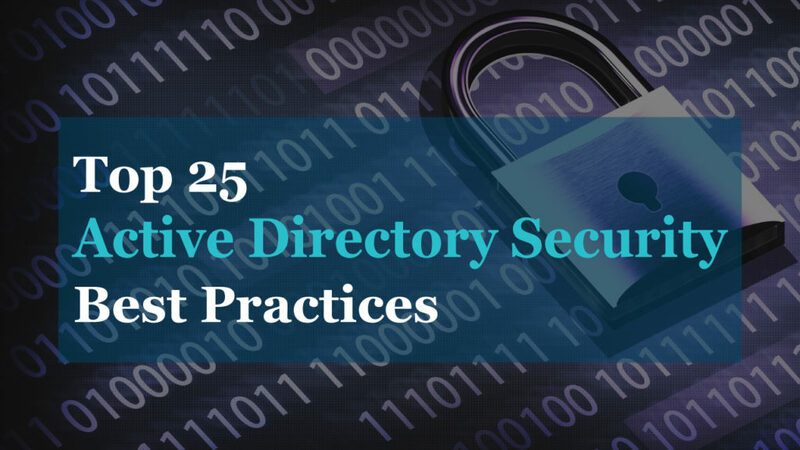 This tool has many safeguards in place to prevent you from blowing up Active Directory. It is a very powerful tool with lots of options making it a great choice to automate the whole cleanup process. It’s an old tool but still works on new domain controllers, I’ve tested it on a 2016 DC. By default it will only modify 10 accounts at a time, if you want more you have to specify the number. Like I said many safeguards built in place, that is a good thing….trust me. Let’s look at how to use this tool with a few examples. Extract the zip file and put the oldcmp.exe somewhere that’s easy to access from the command line. 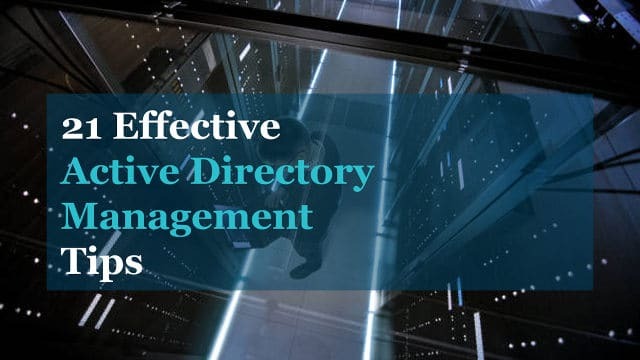 To run these commands open command prompt and change to the directory where the exe is located. That’s it for method 2. This last method uses Powershell to search the password last set attribute, you will need the PowerShell Active Directory module loaded for this to work. The command below will display all the computers by name and password last set date. I can see below there are several computers that haven’t been reset in a long time. The only problem with this command is that it will display all computers in the domain. I only care about computers that haven’t been reset in the last 90 days, there are a couple of ways to deal with this. Now I can open the results in excel and easy remove what I don’t want. Another option is to create a variable that will help filter the results. To do this I will use the get-date cmdlet to create a variable that sets the date to 90 days ago. Here is the command to create a variable, the -90 sets it to 90 days ago. You can change that to whatever days you like. Now, I include the date variable plus the less than (-lt) argument to the original command. Now it will display only the computer accounts that are older than 90 days. This last step is optional but I will add in a command to automatically remove the accounts. To accomplish that I add in the remove-adobject cmdlet. That’s it for method 3. Hopefully, you found this tutorial helpful. You can try out each method and determine which one is best for you. 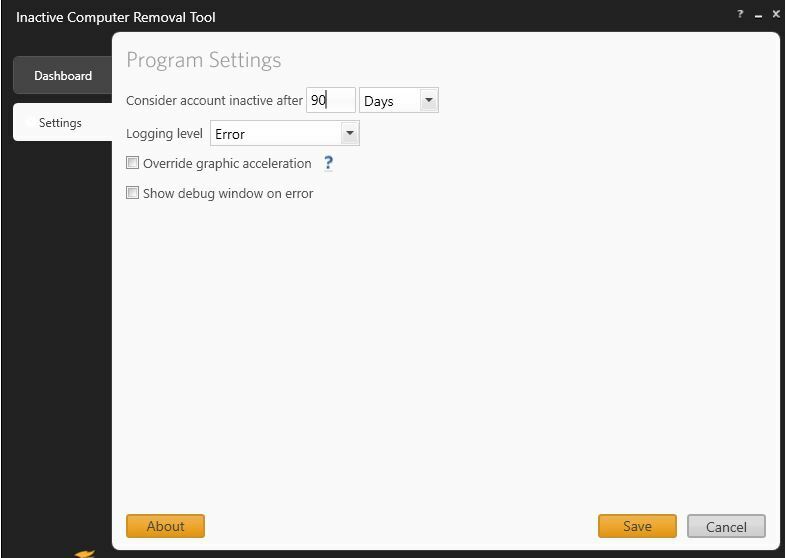 The SolarWinds tool is a good place to start, it is quick and easy to implement. If your looking for something more advanced with more options than either oldcmp or PowerShell should do the trick. If you have questions or run into any problems, post a comment below. You are absolutely right, if inactive accounts are not removed they can be used to gain access to resources. This is why I run a monthly task to check and remove inactive computer and user accounts. The last three powershell commands worked great. You should add that they need to be run sequentially.